I never had a game store nearby when I grew up. Going to one meant getting on a plane, and when I got the chance I always made sure I had enough suitcase space to carry everything back with me. It was the same with conventions; I didn't often get the chance to go, so when I did, I went on a shopping spree. Some of my fondest gaming memories are of those stores. Sometimes finding them would be a huge pain - is it closer to this or that subway stop, what landmarks are nearby? - which, oddly enough, made getting there all the more rewarding. Then I'd search through the racks, looking for that one book or game that I needed to complete my collection. Sometimes I'd be lucky, sometimes not, but there was always something there to pique my interest, maybe even a game I'd never heard of before that moment. One of the places I've spent a lot of time in is The Compleat Strategist, in New York City. The New York location is the flagship store, and there are satellite stores in three other locations on the East Coast. Mike Kilbert, one of the owners, was kind enough to take a few moments out of his busy day to talk to me about the store, and the joys of retail in New York. Adam Gauntlett: If you were trying to describe to someone who's never been to the store how to get there, what would you say? Mike Kilbert: I'd tell them to head for the Empire State building, and we're half a block away. I think that's a pretty big landmark! Gauntlett: Difficult to miss! What does the Compleat Strategist sell? Kilbert: Everything related to games, so everything from boardgames, roleplaying games, figures, even something as mundane as chess and Monopoly. Kilbert: It's been more than 25 years; we opened in 1975! Gauntlett: What was the Compleat Strategist selling back in 1975? Kilbert: Whatever was available, which meant games from Avalon Hill, from SPI, some chess sets, and a lot of military books. Mainly strategy and wargaming. Gauntlett: How long have you been there? Kilbert: Since the beginning. So you can tell I'm just about 25 years old! Gauntlett: I wasn't even going to go that far! Youthful and vigorous would have been the way I'd have put it. Kilbert: When the store opened I was standing on a box so I could see over the counter! Gauntlett: Why open in New York? Kilbert: Basically, we're from New York, we live in New York. We never dreamed of having a chain; we thought it would only be one store, and the perfect place for it would be New York. My father and a friend of his, George Blagowidow opened the store, with the idea that it was a possibility for something like this. Actually it goes a little back, because George was a publisher and producer of military books. He would go around the United States selling his books to small stores, and he noticed that the bookstores were doing quite well. He was approached by Avalon Hill and SPI, who suggested that, as long as he was selling military books, he might as well sell military games. It seemed like a natural tie-in. He said OK, and for a while he sold directly to the bookstores. He noticed that the bookstores' sales were going up and up, so he approached my father and said, why not just open up a store that sells these games? And that's what he did! Gauntlett: What's a typical day in the life of the Compleat Strategist? Kilbert: We get to the store, the first thing that happens is we get our shipment for the day. We get shipments every day, usually new product, new games we haven't seen before. We start to price it, put it on the shelves, and at the same time we have customers coming in. Some are locals from New York City and the surrounding area, but a lot of them are people from all over the world! Gauntlett: How much of the business is mail order, and how much walk-in? Kilbert: Very little of it is mail order, we're not competitive because we can't cut to the bone like websites do. They don't have overhead, so they can afford to make $5 on a $50 game, and we can't do that. We rely on walk-ins. 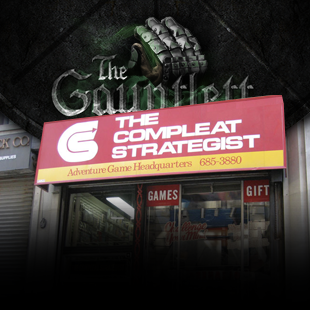 Gauntlett: I know you're one of the few specialist game stores in New York City, if not the only one these days. Why do you think that is? Kilbert: It's not a profitable business, and it's not a big business. If it was any bigger, someone would open up a huge store and knock us out. But there's no opportunity, so nobody's stepped in!